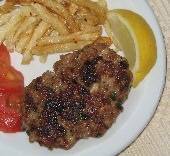 This recipe for lamb burgers with olives is quick and easy to make, and the tart taste of black Greek Kalamata olives gives the burgers an unexpected taste. 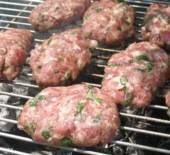 The recipe makes 8 to 9 small burgers and serves 4. Combine all burger ingredients in a bowl and use a spatula to combine. 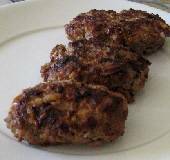 Form the lamb mixture into 8 or 9 small patties and cook on the grill or under the broiler until centers are pink (or more well done, according to taste). Skillet: Preheat 1 tablespoon of olive oil in a skillet over medium heat. When the oil is hot, cook burgers for 3-4 minutes on each side until done (pink centers, or more well done if preferred).